Auto Transport Trailers are what your are car will be shipped on. You should always check with the auto transport company to see what kind of transport trailer your car will be shipped on. Depending on your situation and finances, you will have several choices in which to ship your car. For the most part, you car will be safe on any auto transport trailer. This is a typical 10 car carrier. It is one of the most common auto transport trailers used in auto shipping. Your car will be transported with other cars and will be exposed to the outside elements. The below is an enclosed auto carrier. Most of the times, you car will be transported by itself. Most importantly though, you car will not be exposed to natures elements. These are commercial auto transport accessories. There are also for the everyday consumer to ship their car. 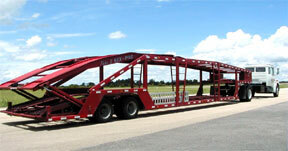 They also have auto transport trailers for sale and auto transport trailer rentals. There is an auto tranpsort trailer for every situation whether you are an individual or a commercial auto transport carrier that fits your needs.